A fanciful giveaway for your friends who have it all. Set of 3 noteclips. These mini noteclips can have your favorite quote / lyrics to a song / poem etc. Words say, inchesTo love is to receive a glimpse of heaven. inches Includes the couples' names and date of marriage. 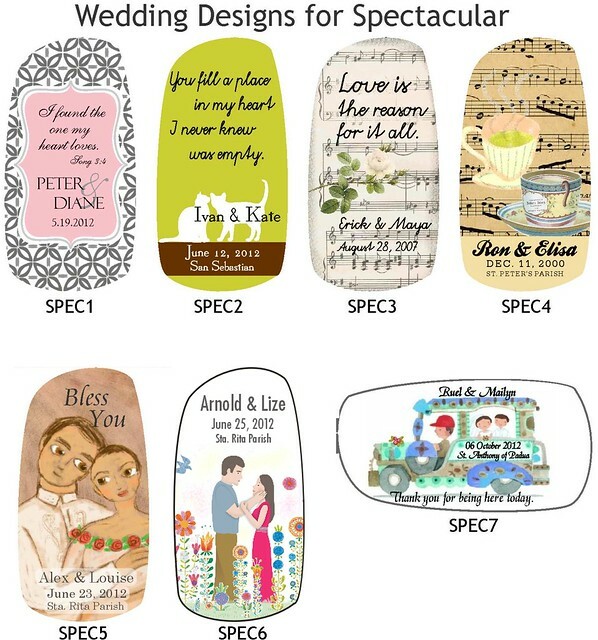 Choose from our template designs. See another picture. An eco-friendly desk accessory for both men and women. This can be a giveaway for your event too! Base is either in mahogany antique finish or with whitewash finish. Made of recycled wood. There is a 20% discount for 50 pcs or more of the same design. We only accept orders of 50 pcs or more (one design). For designs with pictures, there is a one time fee of ₱200 for photo - but only if editing is needed. Practical and durable, this giveaway will help your guests recall a memorable celebration for a long long while. You can personalize the clip and also change the tag design. *Price is for a set of 3 noteclips. An eco-friendly token which is practical and lightweight. Reads inchesI found the one my heart loves inches. You may send us your own design. Made of upcycled materials. Each is individually handmade with care. You may want to pack it in a dainty pouch. Holds business cards, notes, etc. too! Colors may be suited to your preference. Pictured at left is a yellow base with gold outline. Minimum order for new colors is 50 pcs. To have personalized message/names on bottom part of placecard holder, add ₱20. Stands 1.5 inches high x 1 inches x 1 inches width, 150g, each made of durable resin. For a bulk order, you may change the color. Click here to choose the color. Metallic colors will have a higher cost. There is a 20% discount for an order of 50 pcs or more of the same color. A memento your guests will cherish for always. This can be used as matching coasters or as a collectible decorative plaque. Made of durable resin. Size 9 cm x 9 cm x 5 mm, 100g. It has space for personalizing on the banners. Font used is Shelley Allegro. See other fonts here *No design changes, just the wordings and fonts.